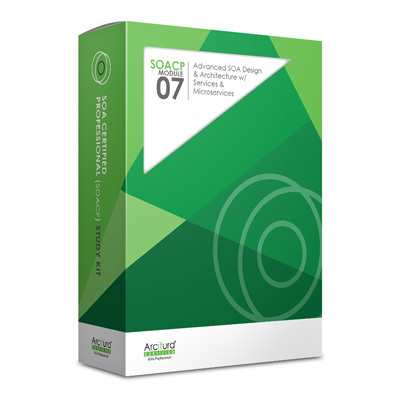 This Study Kit contains the complete set of course materials for SOACP Module 07: Advanced SOA Design & Architecture with Services & Microservices. This Study Kit further includes a number of additional supplements and resources designed to support course completion and exam preparation via independent self-study. Also included is the SOA Design Patterns paperback text book from Prentice Hall. For more information about this Study Kit, visit the SOACP Study Kit 07 page. Also available are optional add-ons for the purchase the associated exam voucher and eLearning Study Kit. The exam voucher add-on is for a pre-paid Pearson VUE voucher for Exam S90.07B, discounted from $150 to $100 USD. The SOACP eLearning Study Kit 07 add-on provides on-line access to course materials and media content.